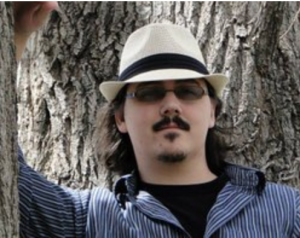 K. J. Russell is an author of speculative fiction based in Houston, Denver and Colorado Springs. His novella, Absolute Tenacity, has been described as “the kind of story that force feeds you bits and pieces, slowly filling your psyche with reveals and snippets of underlying horror, until the needle is brandished and you (along with the story) pop violently with a raw, unexpected ambivalence.” He is often seen at conventions in his home towns and beyond, and is an active member of both the Houston Writers Guild and Rocky Mountain Fiction Writers. On behalf of the HWG he has edited two anthologies of science fiction and fantasy. His novel, The Dusty Man, will be published in May 2015. Connect with K.J. Russell at his website, kjrussell.com, or on twitter @KJRussell_write.